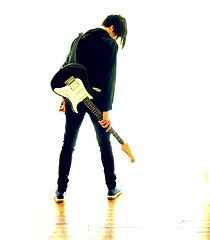 I want to be a Rock Star! Who wouldn’t want to be a Rock Star? You make a lot of money! Have a large number of adoring fans. Girls want you! Everybody wants to know you. Is it the fame or money? Maybe it is the power that goes with fame and money that is so intoxicating! Rock Stars are like politicians! They are powerful because they know people and entertain. Who wouldn’t want to be on stage and have 40,000 people screaming that they love you and clap and cheer everything you do? Why do we envy this talent? Yesterday or was it a couple months ago, you were an ordinary guy until you became famous. Did the money change you or was it the fame? Money and fame can change people! Do you change or do people react to you differently? It is hard to tell! What is it about fame that it changes people? What is it about celebrity that brings out the fans? What is it about fame and money that everyone wants it? The people on Jersey Shore were ordinary people before they were transformed into celebrities. Reality shows transform ordinary people into celebrities or at least famous. If popular, they earn more and suddenly have power. Would you do anything for fame and money? We give them a platform or TV show to speak! Does being a fan mean you will listen to them or do you like what they do? There are reality shows that feed off of our desire for fame and money. MTV has a show of famous homes, Home and Garden TV has a whole channel about what you can do with homes. There are reality shows on MTV, VH1 and mainstream TV about famous people or they become famous from the show. Some may consider these as a phenomenon, but before reality shows there were game shows. Let’s not forget that there are people lining up to become actors, entertainers, comedians, newscasters and other careers in front of the camera. Is there anything wrong with that? Is fame limited to people who appear in front of the camera? There are professional athletes, high school and college athletes (on a smaller level), politicians, authors, CEOs and experts (college professors, consultants and a variety of professions). There are famous people in every profession such as medical doctors, lawyers, teachers, professors, designers, and even bloggers. What is it about fame that is so seductive? Don’t you want to be the best? Everyone talks about goals, careers, money, earnings, working conditions and lifestyle. We are always asking children what they want to do when they grow up. Do you have to be famous to be happy or successful? If you are doing something you enjoy, you will be good at it. Perhaps that statement is too simple because you have a lot of different interests. It is your job or objective to look into all those interests and spend the time to figure out what you should do. I have run into many people who have jobs or even careers who say they are unhappy, but they do not know what to do! They never spent the time to figure it out. Do you want to be someone who worked in a job or career which you do not like? If you are sixteen, start investigating the careers you like and have the skills and talent to succeed. If you are twenty, you should start to put your plan in action in college or trade school. If you are older, why not reflect on your career and think about what you like and dislike about your career. It is never too late! I am in my seventh career! I have earned considerably more money and had opportunities for fame although at a modest level. I enjoy my career as a teacher because I like to influence young people through skills building. My journey of business executive, business owner, consultant and teacher, although related evolved over time. You can always complain about your life, but successful people make changes to make their lives better. So nothing has changed for me! 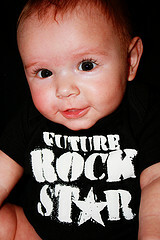 I want to be a Rock Star! Thanks! If I had only continued my piano lessons, this could be a reality. Oh, well! Rock star isn’t my thing, but I’ve always said that I would play any professional sport for 40K a year (maybe not even football, even though I love it, too many long-term effects). I don’t like the spotlight on me personally, but when I get to combine it with teammates and lose myself in competition, I don’t mind people watching. As a teacher, when everything goes right, it has some similarity to adoring fans in a rock concert. It is that great feeling of getting through to a group or students that I enjoy. I have no desire for Fame at all. It seems like a lot of trouble. I don’t understand those reality stars. Are they really famous? Why do people care what they do? I agree that you have to evolve. I used to like what I do, but it’s time to move on. I love that you have done so many things. It’s an inspiration to me. Thank you. I think all of us will have multiple careers, some very different and others similar. I think I may too old for Rock star, but I want to be remembered for something. Oh the desire to have a legacy! I’m such a private person that I don’t know if fame is very seductive to me, at least not at the present. I certainly understand it has power, but it is also not my end-goal. Have you ever wondered what it would be like? The road to fame would be a fantasy, but one I would never pursue. I enjoy my privacy too much and I would enjoy center stage for 40,000 people. You are doing the right thing! Reality shows are just entertainment. I am a firm believer in action. You can talk away and complain away but that gets you nowhere. Take action and make a change and then you will get results. There is so much wasted energy on discussion these days. People could do a lot more if they applied that same energy to action. I am a very proactive person and I am constantly making changes to improve my situation. I always learn something new and a lot of the time things do get better. My success is based on achieving goals! I have always been ambitious and strived to achieve more and more. I find that there is a huge gap between what people say they want and what they are willing to do to achieve them. It’s important to be flexible, self-aware, and dialed into the general business climate. Staying rigid won’t help with long run success. Life does seem to operate in stages. I look at it like a football game – there are 4 quarters. Within each quarter, there are many plays. A quarterback needs to recognize what’s going on, and call an audible once in a while. You’re right, successful people adapt and change as opportunities occur. The most important people in my life adore and love me and that is enough for me! Thanks for this post today, I needed it. I don’t want to be a rock star. For one thing, I sing like a dying cat. For another, I like simplicity. Even if I were to become famous on some small level, I wouldn’t like it. But for the alluded “rock star” quality in life, yes, I suppose I do want to rock at all of my personal goals. I want to reach for my own personal happiness and successes. I want to surpass expectations and become the person I want to be. I would definitely not be a singer! I achieved my “Rock Star” pinnacle when I was 38 years old. I achieved financial freedom by setting goals and executing a plan to help me achieve it. My happiness comes from a great marriage (43+ years), wonderful relationship with my kids and a fulfilling career (teacher, last 10 years). Financial freedom provides choices! I can do the things I enjoy doing. Hi, I wouldn’t mind fame, but being a rock star isn’t for me! I can’t carry a tune, and wouldn’t like to be that recognizable. Although, I’d be okay with being like Suze Orman or Jean Chatzky! I am intrigued with the attention! Along with fame comes loss of privacy and much more. Being a PF expert may be a nice compromise! I don’t think I want fame, at least the kind where you lose all of your privacy, people expect that you live a certain lifestyle, and everyone wants money from you! I like to keep things more private. And I love “rich” people who are in the closet. I see fame as a by product of success. I am not talking about “rock star” fame. I grew up with many rich people who never flaunted their wealth. In fact it was considered rude to display your wealth. For the record, I would not want fame because I am unprepared for lack of privacy. I think I really want to be considered an expert or admired for what I accomplished.